Point Blank, located in San Jacinto County, is a lovely city in Texas. Point Blank was previously known by the French name, “Blanc Point,” but was changed over time. Point Blank exudes a small-town vibe with under 1,000 people populating the city spanning just over two square miles across the 77364 zip-code. This Lake Livingston subdivision presents homebuyers looking into Point Blank real estate with everyday conveniences like the Hill Top Ice House, a branch of the United State Post Office, gas stations, restaurants like Subway, and a Volunteer Fire Department. 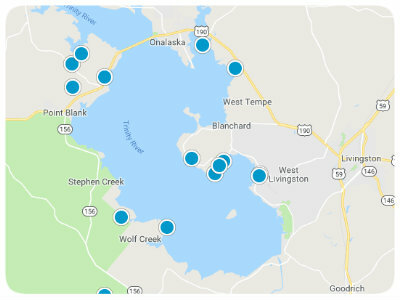 Lake Livingston is in proximity to Point Blank giving residents the opportunity to fill their itineraries with endless aquatic activities. 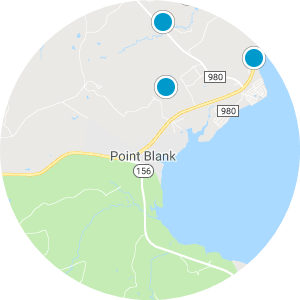 Point Blank residents are also near the US-190 making commutes less of a hassle. Brick, stone, and wood exteriors lock in the eye to the beautiful Point Blank homes for sale. Houses featuring three to four bedrooms with more than 2,000 square feet of living space can be discovered in the area along with homes boasting comforting, familiar front porches on which to watch time pass with loved ones. 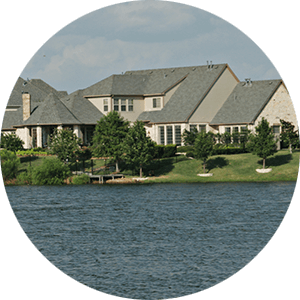 If you are interested in purchasing affordable houses for sale in Point Blank, Texas, please contact us today. Two Beautiful Interior Lots, in Gated Community. 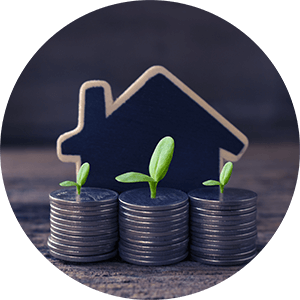 Bring in your manufactured Home or build your Dream Home. Good Fishing and Boating on Lake Livingston. Remote, rural property. Great chance to build equity! NEED GATE CODE TO ENTER SUB. ,,, ,23.955 Acres for sale in Point Blank City , please verify information such as utilities,measurements.